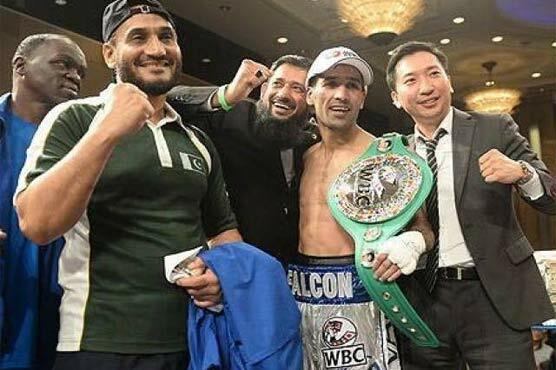 SEOUL (Dunya News) – Pakistanâ€™s only professional boxer Muhammad Waseem Sunday defeated Philippinesâ€™ Jether Oliva for World Boxing Council (WBC) Silver flyweight title in Seoul. In a 12-round competition, Waseem strongly knocked out Oliva and managed to gain fourth position in international boxing ranking. Belonging to Quetta, 28-year-old Waseem is the first boxer of the country who won the WBC international professional title. He underwent two-month special training in United States and Japan for this fight. Muhammad Waseem began his professional career in South Korea last year and won the Korean Bantamweight title on debut. He had previously secured knockout wins in all three of his professional bouts and also had an impressive amateur record with 2014 Commonwealth Games silver medal and 2010 World Combat Games gold medal to his name.